My family does not camp, but 4,000 miles in a car with a 6, 9, 12 year old daughters has to be similar to camping. The summer of 2001 included our family’s all-time favorite 16 day summer vacation to Tucson and work trip to Glorieta, NM. Beautiful scenery, Tombstone, the desert golf courses, a jaunt into Mexico, visiting family and a water park along the way, and then a week at Glorieta Baptist Conference Center where I led several workshops while our kids joined into various activities. A special family trip. A favorite activity was riding horses into the AZ desert at sunset and returning at night under the clear moon light. All four girls and I rode into the beautiful desert of AZ, compliments of winning a giveaway at one of those timeshare presentations. Macy, our youngest daughter, drew Big Red as her horse, so off we rode. Big Red’s job was to carry riders down a path to expose them to the AZ desert and safely return them to the ranch. Big Red carries all types of riders, young and old, men and women, boys and girls, and people from all across the world. With paying riders, Big Red performed his duties because his owner wanted a return on his investment. Having grown up around lakes and beaches, I am more familiar with water happenings, than farms, but both of my parents grew up on rural farmland in Mississippi. So, I have personal experience watching a mule pulling a plow a garden. What could I possibly learn about stewardship from a horse named Big Red and its young rider? Preparing mature horses to safely carry riders takes intentional work. Horses are born out of birthing pains and care of its owner. From the early days to the riding of the horse into the desert, the owner attends to the horse, provides water and food, watches and nurtures its development, cleans up after the horse, even the stinky stuff. The owner provides a safe place for the horse to rest and grow and learn as it matures. The owner trains the horse from walking to running, from no saddle to a saddle and then a saddle with a rider. The owner teaches the horse commands and how to respond to the bit in its mouth, all because the owner wants a return on his many investments into the horse. 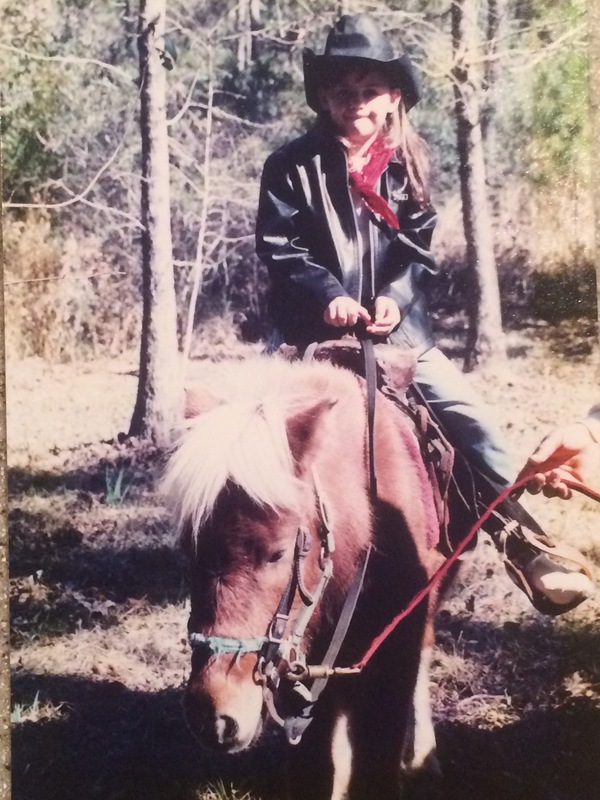 Macy looked the part as a rider with her cowgirl getup, but she had never been on a horse before. She had absolutely no idea or appreciation for all that went into caring for and developing that horse so that she could ride into the AZ sunset. Truth be told, neither did her older sisters or her parents. God is the owner of everything. He is expecting a return on His investments into our lives, just like the owner of Big Red. We are all stewards of many things. God has entrusted much to us and we should handle our stewardship with care, just like Macy on top of Big Red. Many of the things we steward were birthed and developed out of the pain, sacrifices, and generosity of others, just like Big Red. We did not find the world empty, let’s pay it forward. Parents…. My wife and children, how God created them and how I get to help them grow and mature into all that He created them to be. They belong to Him, but He expects me to steward my responsibilities well as one who will given an account. The Scripture teaches that generations will be impacted by what we do in our roles as parents with our children. Parents, our greatest investment of time, emotional energy, thought, and financial resources will probably be in our children. Do it well as unto the Lord. Church leaders and pastors… Churches really do belong to Jesus as well. He owns them, we steward them for a time, but then pass them on to the next generation to enjoy and serve Him for His glory. Should you be a part of the birthing of a new church, it is still His church and the people are His people. The vast majority of followers of Christ in a church, like Macy with Big Red, have no idea all that went into having that church there for them. Churches have birthing pains, require enormous amounts of attention, create lots of messes, and have to constantly be nurtured as they develop through their years. Often land and buildings are secured, built and paid for by those who have come before us that are either with Jesus or that we may never meet on earth. People all throughout the past have cared for the bride and put their special little touches all over the churches, certainly imperfectly. Steward your church with humility, wisdom and a grateful heart that you get to participate in caring for the bride of Christ. Pastors and church leaders, like Big Red, ride and enjoy, but handle with care, because we are not the owners. We are the stewards of all the investments that preceded us. We steward for a season before we handoff the bride of Christ to the next generation. Cultural norms and current challenges before churches may be different, but the task is the same, to safely lead people to Jesus for His glory. Let’s not be reckless in our stewardship, but be found faithful as one who will give an account. As for my tribe of Southern Baptists, we too are facing difficult cultural norms, expectations, and unique challenges and opportunities in all aspects of denominational life. Whether you find yourself serving the local association, the state convention, or the national agencies and seminaries, steward them well as one who will give an account before Jesus. There were birthing pains, costs of training, caring for and developing that to which you now steward. Macy was riding a horse she did not birth, care for, feed, clean up after, train or finance the expenses. After she gets off, the horse will still have new riders that will come along. This is true for most every denominational worker in the SBC. Enjoy and lead, but do it with care as one who will give an account to God Himself. Parents, church leader, pastor, or denominational leader, you play a significant role. However, remember with humility of heart, that you are not the owner, but a steward of what God has been entrusted to you, not just for your benefit, but for the future and eternity. Steward well so that Big Red can carry others safely home in the future. If you find yourself sitting on top of a horse, remember you are not the creator or owner of the horse, so steward it well.